Pork and beans were meant for each other—think franks and beans from the States or cassoulet from France, to take just two examples. 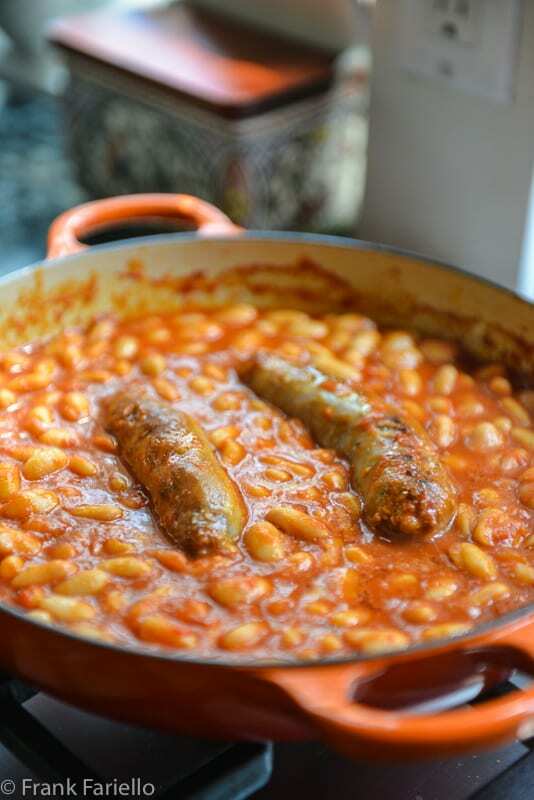 Italians enjoy the combination, too, of course, as in the festive Cotechino with Lentils, or the rustic fagioli con le cotiche, or in this simple, everyday dish of salsicce e fagioli, or sausage and beans. There’s hardly anything to it: sausages are browned in olive oil, then simmered with tomato sauce to which pre-boiled or canned beans are added to simmer just long enough for the flavors to meld. Some onion and fresh herbs go into the mix, but the sausages themselves provide most of the flavor, as they should. An excellent example “pantry cooking”, making sausage and beans requires no real culinary skills. If you’re using canned tomatoes and beans, it shouldn’t take more than 30 minutes or so. It’s a great make-ahead dish that reheats beautifully. And you can recycle any leftovers as a pasta or soup. This is the kind of no-fuss dish that’s great to have in your culinary back pocket, especially nice as the cooler weather sets in. In a sauté pan or braiser large enough to hold all the sausages in one layer, brown the sausages on all sides in abundant olive oil. When the sausages are nice and brown, add the minced onion, seasoning everything generously with salt and pepper. Stir from time to time. Continue over gentle heat until the onion is soft and translucent, then add the wine. Raise the heat and let the wine evaporate. Add the puréed tomatoes and herbs to the pan, making sure to distribute the tomato evenly, and adjust the heat so the tomato simmers gently. Continue simmering until the tomato has reduced and visibly separates from the oil, about 15 minutes or so. Add the beans and mix them into the sauce, along with a ladleful of water or broth. Let everything simmer for just 5-10 minute more, long enough to allow the beans to heat up and the flavors to meld. This is one of those recipes where measurements hardly matter. You can gauge the number of sausages and the amount of beans according to your appetite and whether you’d like your dish more carnivorous or vegetarian. Add more or less tomato depending on how ‘red’ you’d like your dish. You can vary the amount of onion or herbs, too. In short, this dish is almost infinitely customizable. As indicated, I like to use canned tomatoes for this dish, passed through the largest holes of a food mill. But here again, there are lots of options. You could add the canned tomatoes directly to the pan, perhaps crushing them between your fingers as you add them. You could use tomatoes that already come crushed or diced, of course. Or you could use passata, whether store-bought or your own homemade variety. I also like to use canned beans. They’re a real time-saver. But do make sure to rinse and drain them before using to eliminate that “canny” flavor. You can also use the equivalent weight (about 800g or 28 oz) of homemade boiled beans, of course. As mentioned, you can make the dish ahead—it’s even better when you do so. And if you have leftover beans, reheat them with a ladleful or two or water or broth, then add cooked pasta, and you’ll have a nice bowl of pasta e fagioli. (Any leftover sausages can be cut up into small pieces and added to the pot.) Or you can thin our the beans with even more water or broth—purée them if you want—and serve them as a soup, with some nice crusty bread. In some recipes for salsicce e fagioli, you sauté the onions first before adding the sausages. This follows the usual pattern in Italian recipes, beginning with a soffritto as a foundation that infuses the other ingredients with their flavor. In this case, I like to brown the sausages first over fairly high heat, adding the onions afterwards so there’s no risk they will burn. I don’t find it makes any noticeable difference in the result. The sausages have lots of flavor on their own—it’s the beans that need the infusion of flavor. Indeed, you can think of the sausages as part of the flavor base as well as a main ingredient. Instead of onion, you could use garlic, in which case add a few peeled and slightly crushed garlic cloves to the pan before your brown the sausages or even as they are browning, removing the cloves when they start to brown. Or you could use both onions and garlic, in which case I would add minced garlic to the already soften onions for just a few moments, then proceed to pour in the wine. The wine, by the way, can be red or white. I find either equally good. Or, if you can just skip the wine, adding the tomato directly after you sauté the onions. A pinch of hot pepper can add a bit of spice to your Sausage and Beans if you like. The beans are typically cannellini or borlotti, but really any bean or other legume would work here. I’m not even hungry, so it must me all your delicious recipes making me want to make each dish I’m seeing (getting caught up from when I was overseas)! I love beans AND sausages, but never make them together; it’s a crime, I know. Thanks for all these great ideas and I will be making this once the thermometer gets below 100F here! Ugh! Pork and beans are good in every food culture! I have never made salsicce e fagioli but I am going to rectify that. Recipe is printed. Now I need to find some really good salsicce. This is one of those delicious but simple recipe – true Italian cooking! Thanks for sharing! And thank you for stopping by, Marcellina. Hope you like the dish! There are 2 PDO beans in Italy: “Fagioli Bianchi di Rotonda” and “Fagiolo Cannellino di Atina”. And then there are 4 PDI beans: Fagiolo di Cuneo, Fagiolo di Lamon della Vallata Bellunese, Fagiolo di Sarconi and Fagiolo di Sorana. But if you can find them (it’s a very small production) I suggest you to try also “Fagioli zolfini”. Well, you have your answer on the beans…. Now I want to learn more about that country sausage. It sounds very nice! The heat is gone, finally, and this is just perfect timing for such a meal ! Thank you so much ! Such great comfort food for the oncoming winter months. Thanks, Frank! Wonderful comfort food, I like the simplicity of this dish . I loved me sausages and I like beans. What kind of sausage do you use? Oops, I meant to say , I love sausages and I like beans. All kinds, depends on my mood. These were some pork and fennel sausages that I saw in a local Italian deli, that they make themselves.Pretty nice. Definitely, comfort food! Reminds me of growing up and mamma using beans as a protein and delicious food extender. The simple rustic recipes are so satisfying. Now with the cooler weather — beans and sausage sound wonderful. Hope your weekend is going well. Thanks, Marisa Franca. It’s actually turned rather warm around here. Enjoying one more weekend by the pool while I still can! Such a nice dish — comfort food at its best. Haven’t had (or made!) this in years. And it’s so good — need to have it again, and soon. Thanks for the inspiration! And thank you for stopping by, John! It is one of those dishes that I tend to forget about, too. But I always come back to it eventually and am glad I did. Frank, as the seasons finally begin to show some sign of change here, my mouth is watering just looking at these photos. A flavorful and simple dish perfect for those busy weeknights or to make ahead. Looks wonderful and comforting! Your sausages always look so good! perfetto piatto western da cercatore d’oro ! Buon weekend Frank !